Madagascar is currently facing a measles crisis. According to Fox News Network, it is the largest outbreak in Madagascar history. The cases have grown to beyond 115,000. 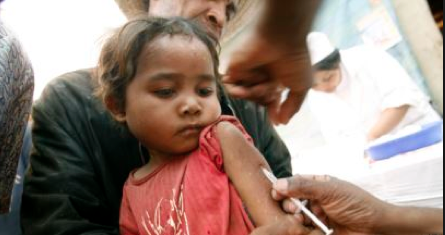 Only 58% of the population living in Madagascar have been vaccinated against the disease. This is one of the biggest reasons this disease has spread so quickly. The outbreak is reported to be most harmful to children. Since September, 1,200 children have died due to this disease. “This epidemic unfortunately continues to expand in size, though at a slower pace than a month ago,” reported Dr. Dossou Vincent Sodjinou. Measles is a highly contagious virus that spreads through the air. It is spread through coughing and sneezing. Symptoms may include a high fever, rash, stuffy nose, and reddened eyes. According to the Mayo Clinic, it usually takes 10-14 days to develop any symptoms. Nurses have volunteered to help out in waiting rooms that were packed with patients. Many parents are not aware that vaccines are free due to their lack of health knowledge. 50% of children are malnourished. This is due to economic reasons. This opens up a door for the measles virus to attack the, already low, immune systems children have. “Malnutrition is the bed of measles,” said Sodjinou. 450 children die each day worldwide due to the measles virus. It is the leading cause of death in children. Immunize.org reported that measles complications are most common in children under five years old. It was reported that the measles disease was “dead” in the United States in 2000. There have been 19 states that reported at least one case of measles. These states include: Arizona, California, Colorado, Connecticut, Florida, Georgia, Illinois, Indiana, Kentucky, Massachusetts, Michigan, Missouri, Nevada, New Hampshire, New Jersey, New York, Oregon, Texas, and Washington.